— Alonso G, Tablado, A., Lopez-Gappa, J. and Magaldi, N. 1995. Seasonal changes in an intertidal population of the amphipod Ampithoe valida Smith, 1873. Oebalia, xxi: 77–91. — 有山啓之 2000. 2) 端脚類　ヨコエビ亜目. In; 財団法人千葉県史科研究財団『千葉県の自然誌』. 本編7 千葉県の動物2 —海の動物—, pp. 318–320. — Barnard, J. L. 1965. Marine Amphipoda of the family Ampithoidae from southern California. Proceedings of the United States National Museum, 118(3522): 1–46, 27fis. — Barnard, K. H. 1916. Contributions to the Crustacean Fauna of South Africa no.5. The Amphipoda. Annals of the South African Museum, 15(3): 105–302. — Chapman, J. W. 2007. Arthropoda: Amphipoda: Gammaridea, p. 545-618. In: Carlton, J.T. (ed. ), The Light and Smith manual: intertidal invertebrates from central California to Oregon. University of California Press, Ltd, London, England. — Conlan, K. E. and Bousfield, E. L. 1982. The amphipod superfamily Corophioidea in the northeastern Pacific region. Family Ampithoidae: systematics and distributional ecology. Publications in Biological Oceanography National Museum of Natural Sciences Canada. 10: 41–75. — Faasse, M. A. 2015. 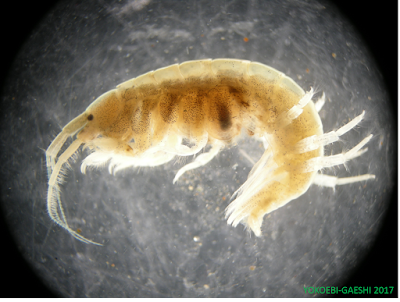 New records of the non-native amphipod Ampithoe valida in Europe. Marine Biodiversity Records, 1–4. — Gurjanova, E. F. 1938. 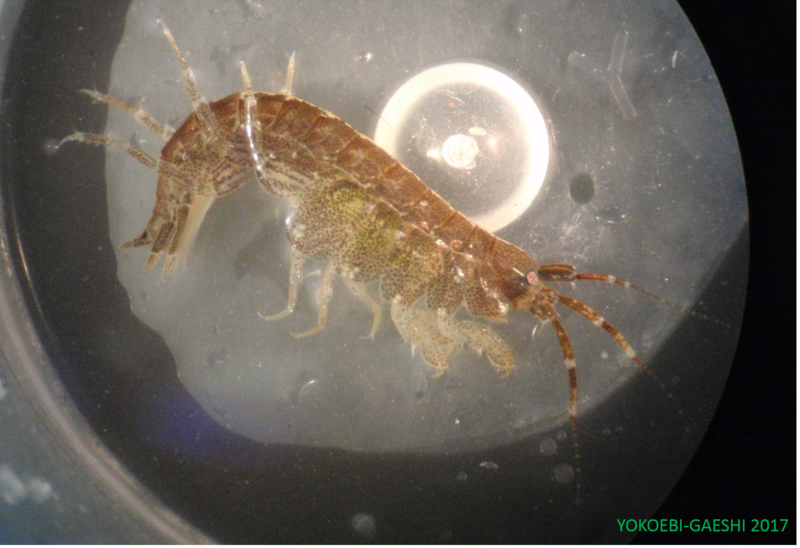 Amphipoda, gammaroidea of Siaukhu Bay and Sudukhe Bay (Japan Sea). Fijnaj Akademii Nauk SSSR, Trudy Gidrobiological Ekspedichii Zinan 1934 Japonskoe More, 1: 241–404. — Gurjanova, E. F. 1951. Gammarids from USSR seas and adjacent waters (Amphipoda – Gammaridea), determinants of fauna in USSR. Zoological Institute Academy of Science, 41: 1–1029. — Gurjanova, E. F. 1955. New Amphipod species (Amphipoda, Gammaridea) from the northern part of the Pacific Ocean. Akademija Nauk SSSR, Trudy Zoologicheskogo Instituta, 18: 166–218. — Hiebert, T. C. 2015a. Ampithoe lacertosa. In: Oregon Estuarine Invertebrates: Rudys' Illustrated Guide to Common Species, 3rd ed. T.C. Hiebert, B.A. Butler and A.L. Shanks (eds.). University of Oregon Libraries and Oregon Institute of Marine Biology, Charleston, OR. - Hiebert, T. C. 2015b. Ampithoe valida. In: Oregon Estuarine Invertebrates: Rudys' Illustrated Guide to Common Species, 3rd ed. T.C. Hiebert, B.A. Butler and A.L. Shanks (eds.). University of Oregon Libraries and Oregon Institute of Marine Biology, Charleston, OR. — Hughes, L. A., Peart, R. A. 2013. 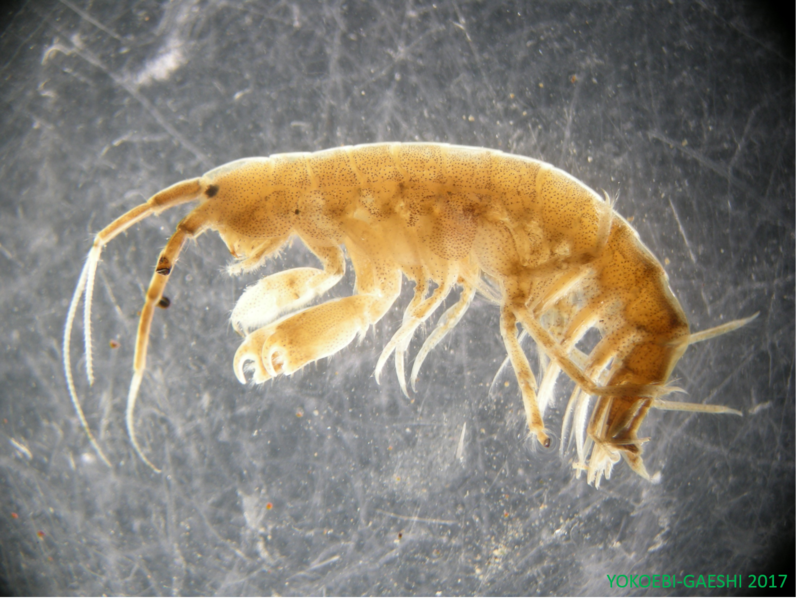 New species and new records of Ampithoidae (Peracarida: Amphipoda)from Australian Waters. Zootaxa, 3719(1): 1–102. — Jung, T. W. and Yoon, S. M. 2014. A New Record of the Ampithoid Species, Ampithoe akuolaka (Crustacea: Amphipoda: Ampithoidae) from Korea. Animal Systematics, Evolution and Diversity, 30(3): 215–224. — Kim, H. S. and Kim, C. B. 1987. 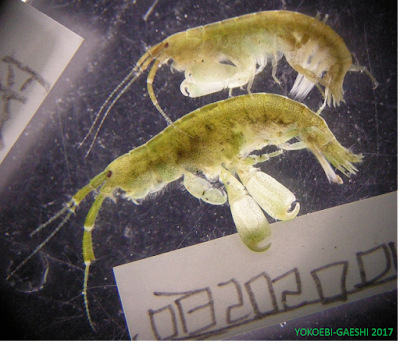 Marine Gammaridean Amphipoda (Crustacea) of Cheju Island and its adjacent waters, Korea. Korean Journal of Systematic Zoology, 3: 1–23. — Kim, H. S. and Kim, C. B. 1988. Marine Gammaridean Amphipoda (Crustacea) of the Family Ampithoidae from Korea. Korean Journal of Systematic Zoology, Special Issue(2): 107–134. — 井上久夫 2012. 茨城県の海産小型甲殻類 III. ヨコエビ相（端脚目，ヨコエビ亜目）. 茨城生物, 32: 9–16. — Martin, A. and Diaz, Y. J. 2003. Amphipod fauna (Crustacea: Amphipoda) coastal waters of the eastern region from Venezuela. Boletín. Instituto Español de Oceanografía, 19(1-4): 327–344. — Pardal, M. A., Marques, J. C., Metelo, I., Lillebø, A. I. and Flindt, M. R. 2000. Impact of eutrophication on the life cycle, population dynamics and production of Ampithoe valida (Amphipoda) along an estuarine spatial gradient (Mondego estuary, Portugal). Marine Ecology Progress Series, 196: 207–219. — Peat, R.A. and Ahyong, S.T. 2016. 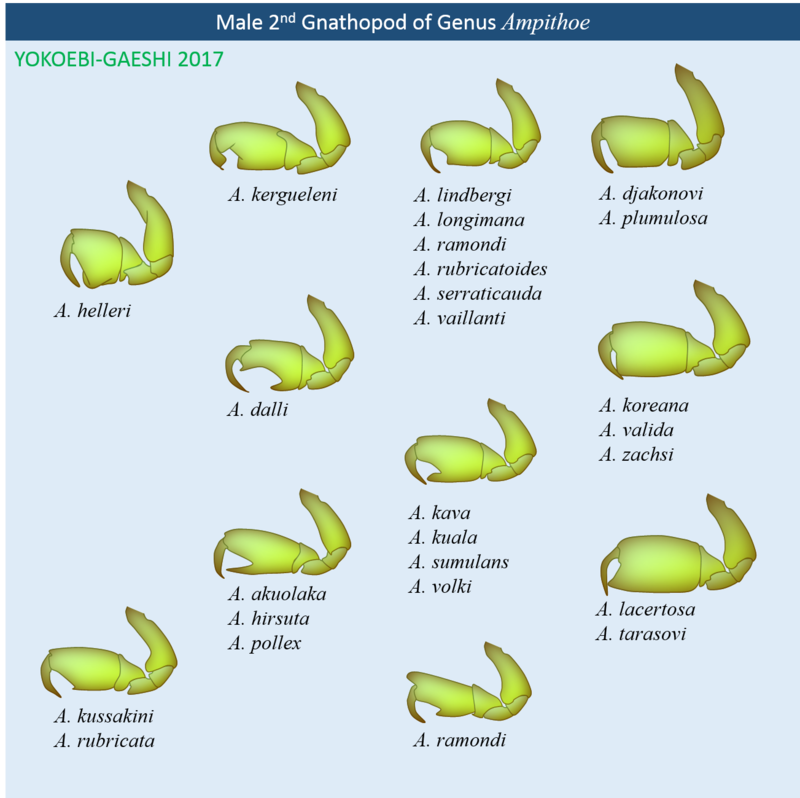 Phylogenetic analysis of the family Ampithoidae Stebbing, 1899 (Crustacea: Amphipoda), with a synopsis of the genera. Journal of Crustacean Biology, 36(4): 456–474 . — Rabindranath, P. 1972. 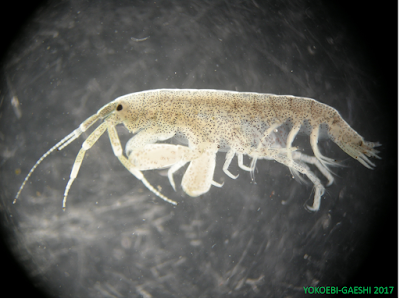 Maine Gammaridea (Crustacea: Amphipoda) from the Indian region. Family Amithoidae. International Journal on Life in Oceans and Coastal Waters, 4(2): 161–178. — Ren, X. 2006. Amphipoda: Gammaridea (I). In: Fauna Sinica, Invertebrata Vol.42, Crustacea. Science Press, Beijing, 588 pp. — Sars, G.O. 1895. An account of the Crustacea of Norway, with short descriptions and figures of all the species. Vol. 1 Amphipoda. Pts 4–9. Christiania & Copenhagen : Alh. Cammermeyer pp. 69–212, pls 25–72. — Shin, M.-H. and Kim, W. S. 2010. Redescriptions of Two Ampithoid Amphipods, Ampithoe lacertosa and A. tarasovi (Crustacea: Amphipoda), from Korea. Korean Journal of Systematic Zoology, 26(3): 295–305. — Sotka, E. E., Bell, T., Hughes, L. E., Lowry, J. K. & Poore, A. G. B. 2016. 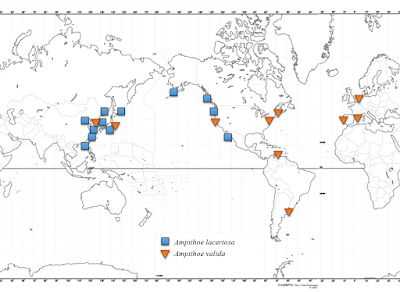 A molecular phylogeny of marine amphipods in the herbivorous family Ampithoidae. Zoologica Scripta, 46: 85-95.